Much I had heard about the movie Khuda Ke Liye [खुदा के लिए] by Shohaib Mansoor, before I went to see it. The chance I had to see it in the month before did not materialise. I was all set to see the movie when I got the chance this time. When everyone who has seen the movie, gives you good reports about it, your own expectations from the movies are a bit elevated. So was my case, and IMHO, the movie did not fail my expectations. But in seeing the movie I could not keep my Indian bias away, and I could see and relate to it only through that. The movie has three focal themes, formation of a fundamentalist, women rights, American view towards Muslims post 9/11. The movie starts with a rehearsal of a music concert for the new years eve, which is targeted by right wing fundamentalists. The scene is reminiscent of so many things that happen here. The lead singers are brothers Mansoor [played by Shan, if Salmaan Khan gets too fat he will probably resemble him] and Sarmad [played by Fawad]. They are from an elite family. The family is progressive in its outlook towards life. What is emphasised in portraying this family is that you don’t have to be staunch fundamentalist to live by one’s religion. The location of the family could have been very well set in India or anywhere, without much difference. The two brothers who have more or less a shared life and ideals till now, which diverge as the younger one is influenced by some Islamic fundamentalists. The character of the Maulana Tahiri [played by Rasheed Naz] is one of the most impressive characters in the film. The power and control that he displays while delivering the dialogues is great. The entire process of conversion of Sarmad from a pop singer to almost becoming a fundamentalist is perfectly shown. Slowly but surely Maulana Tahiri changes Sarmad’s outlook in a very convincing way. The Maulana seems to have justification for every act that is considered pro-liberal. With such convincing attitude he manages to convert Sarmad from a pop singer, who does not even do namaaz, to a dedicated follower of Islam. The change in Sarmad’s outlook is very visible, as now he considers the music which has been his soul as blasphemous. When he asks his mother to have a hijaab, removes the photos from his home, the family realizes that the things are just about to go out of hand. Just change the characters and the process is equally applicable to any fundamentalist group. Is this not reminiscent of how all the fundamentalists find their new cadres? When reasoned in a biased way, even the most idiotic things appear to be correct and justified. Just consider the politics of hate that is being perpetrated in India. The other major theme in the movie is with respect to women’s rights. Mary [played by Iman Ali] is a British Muslim girl, born to a Pakistani father. The father has himself married and is living with a British women, but takes a complete U turn when it comes to his only daughter. Thus he is ready to sacrifice the life of his daughter, in order not to become “a laughing stock of the entire Pakistani community.” By deception he takes his daughter to Pakistan to get her married. This is because otherwise her offsprings would be out of Islam, which is a crime. When his brother [Sarmad and Mansoor’s father] refuses to take part in this act of forcible marrying Mary to one of his son’s, the desperate father approaches Sarmad. Sarmad who is assured by Maulana that this would be a noble deed indeed, takes the father and daughter to the remote tribal area on the Afghan-Pak border. In this remote area Mary is forcibly married off to Sarmad, who does this in order to save the religion. Is this not a common story? Heard not only in tribal and rural areas of Pakistan, but also in urban areas of India? Meanwhile Mansoor is off to America for musical training. In America he finds a mate and enjoys the learning of music there. As the time passes the two become close and finally decide to get married. Just as they get married 9/11 takes place. And Mansoor is taken into custody for being a “terrorist”. Meanwhile Sarmad has changed almost into a fully fundamentalist, makes Mary pregnant forcibly so that she cannot flee from the village, which she has tried once before. The situation of the women in the remote area of Pakistan is not different from that of many women in urban parts of India. Only maybe a freedom of clothes is there, otherwise the fact remains that most of the women are powerless, inspite of the fact that they are educated. The liberation that is provided to the women is a psuedo one I believe in most of the cases. The choices that a woman can make are already limited by men, but they may not be explicit. The story of Mary is also that of innumerable other women who are forced into marriage by their family. This is story which is also repeated in India in all the states, in all the religions, and classes. This aspect has more to do with gender than with religion. Had Mary being a male, things would have been entirely different, her relationship with a white would have gone unnoticed. During the film the main characters don’t loose their Pakistani character and identity. When Mansoor is being tortured in America, the dilemma of progressive muslims is perfectly portrayed. Back in Pakistan they are targeted as being, “liberal” in America they are seen as the face of terrorism, with which they themselves do not identify with. Also the dumbness of the American agencies, just in order to get some leads is exposed. This is true for numerous cases which happened post 9/11. All muslims are not terrorists, but all terrorists are muslims. So all the three focal themes of the film are derived from real experiences of people, which makes them feel real and appealing. Just as things get worse for Mansoor, Sarmad goes for war, things get a bit better for Mary. She is finally able to call for help, and the help does come. She is taken back to Lahore, where she decides to take to court, her husband Sarmad. In what follows in court the intense dialogs try to evoke the logic behind all this matter. Each side is presented in a balanced way, with their own perspectives and logic. To say that Maulana Tahiri is completely wrong is to miss the point of what is being told. Every character has a world view, the point is to understand that from our perspective. Here the guest appearance of Naseer-ud-din Shah as Moulana Wali, is simple superb.What is being portrayed that the interpretation that most people have about any fundamental thing can be multifaceted. One chooses the examples in such a way so as to fit one’s world view, whereas simply and conveniently disregarding the rest of them which do not fit in. When Moulana Wali is called by the court as a religious expert to present the Islamic views on forced marriage, music and other things the view presented are that of a thinker who puts Islam in an entirely new perspective. The views expressed appeal also to the mind, and not only to heart. But people like Moulana Wali are a few, and mostly unheard. 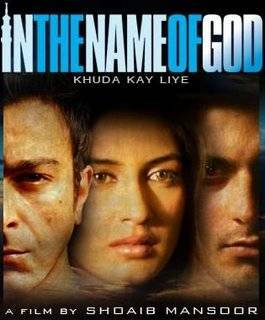 Finally at the end of the film, Mary choses to stay back in Pakistan to start a school, Mansoor is deported to Pakistan in a paraplegic state, and Sarmad realizes his mistakes. As for the music of the film, it is well merged with the visuals. The chants of Allah, Allah … during some of the tense sequels do fit in well. The characters and the story of the film though set in Pakistan, and has a distinct Pakistani touch to it, is equally applicable to many situations. The characters of the film can be set in any situation, where there are fundamentalists forces at play, and so is the story. The dilemma of progressive Muslims is perfectly captured by the director. How the situation changed for many post 9/11 is also effectively shown. The last letter of Mansoor touches ones heart, by telling that you don’t have to punish an entire community for the wrongs of few. This being the directoral debut of Shoaib Mansoor, kudos to him for showing such boldness on screen and capturing what most people knew, but could not show to others. And doing this in Pakistani industry deserves another credit, may he continue making good films, and may more follow him. This entry was posted in 9/11, films, fundamentalism, islam, movie, pakistan, terrorism, women. Bookmark the permalink.